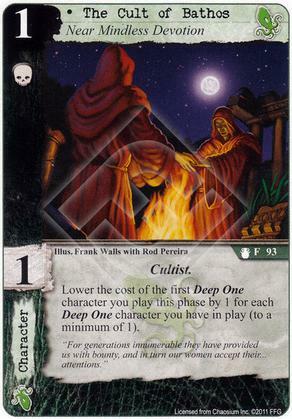 Lower the cost of the first Deep One character you play this phase by 1 for each Deep one character you have in play (to a minimum of 1). Flavor Text: "For generations innumerable they have provided us with bounty, and in turn our women accept their... attentions." What does "this phase" mean? Because other cost reduction cards are "reduce by each turn", so does this mean it only allows cost reduction for deep ones on the turn you play Bathos?